Starlink: Battle For Atlas isn’t a Star Fox game. Nintendo’s furry pilot and his famous Arwing fighter are in the Switch version and—I hope you’re sitting down—not in the Xbox One and PS4 versions. It’s not even fully a toys game, a la Skylanders or Disney Infinity, because it turns out you don’t even need the toys. It is, I learned at E3, an interesting game. 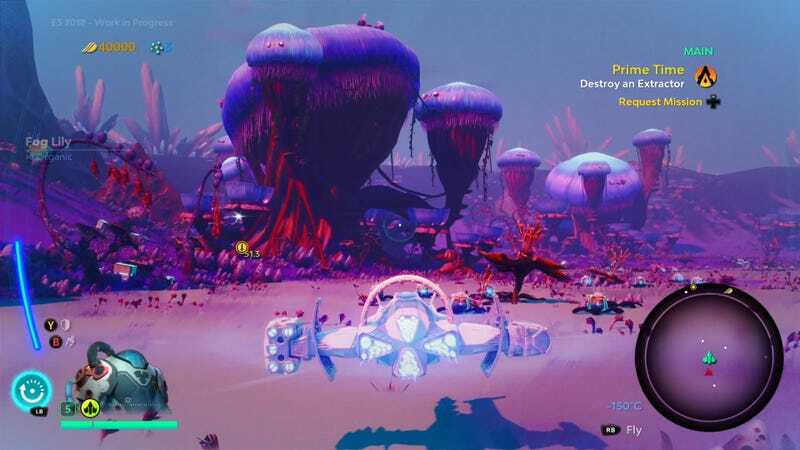 We’ve got video here that shows the game in action on Switch and on an Xbox One X. We’ve even got some fancy picture-in-picture to show how the pilot and spaceship toys that are being offered with Starlink manifest in the game. The main gimmick here is that you can assemble and customise ships and see those ships take shape in the game as you do. Pull off a wing, and the wing comes off in the game. Turn the wing around and put it on backwards, and it goes on backwards in the game. Unsnap a cannon, replace it with a flamethrower, and those usable weapons change in the game. Players can snap on weapons and wings as they customise the game’s ships. All these items can be purchased digitally if players prefer that. Okay, so there are spaceships to assemble, but you don’t have to have the physical ships. Nice, but so what? The 16 October game seems like Ubisoft Toronto’s riff on No Man’s Sky, with the huge caveat that it’s hand-made, unlike Hello Games’ procedural adventure. Players fly spaceships through space, then rocket seamlessly to the surface of beautiful planets, where they encounter systemic ecosystems of creatures. You can fly over the surface of these planets or go into a hover mode so that it has more of the feel of a third-person action game, with a focus on blasting enemies with your ship’s weapon. There’s a light RPG system to all of this, with different pilots having different upgradeable skills. In the demo I was shown, there’s a big walker alien who is seeding a planet with towers that I needed to destroy to get resources. If I’d left it alone, I was told, the walker would keep building up its towers. This, apparently, is how planets work in the game. I didn’t see it, but allied forces can also be built up and operate on their own after a player leaves the planet. As I played Starlink for about 40 minutes across Xbox One and Switch earlier this week, I was surprised at how good a time I was having. On Xbox One, in particular, the planet I was on looked stunning, like concept art come to virtual life. On Switch, I had a blast configuring an Arwing. On both platforms, I was finding a good amount of enemies to fight as well as structures that I was told include side content like puzzles and mysteries. It’s a game still designed and priced on that toy-game model. Starter packs come with starter pilots and ships. More are sold separately. If your ship goes down, you can resume without restarting if you have a spare ship, which clearly incentivises you to either play better or buy more ships. The PS4 and Xbox One versions include one starship, one pilot, and three weapons. The Switch version has the Arwing, Fox McCloud, a second pilot, four weapons and some exclusive Star Fox mission stuff. Other packs of more ships, weapons and pilots are sold separately. Before E3, Starlink wasn’t a game I planned to play when it was released. Now? I’m going to try it. I can’t say yet if it’ll be great or just interesting or what. But I can say it’s more beautiful and more fun than I expected. It demoed well. And it removes some barriers to entry that other toy games have in terms of requiring you to buy a lot of toys, even if there are some question marks about how the game’s design might push players toward extra purchases.